The sun is finally shining in Kentucky, and your kiddos might be begging to get outside and soak up the fresh air. Studies show fresh air can boost your immune system; clear your lungs, improve digestion, boost your energy, and brighten your mood. Luckily, the Louisville Parks and Recreation Department has many ways for you to enjoy the outdoors with your friends and family. Louisville Parks and Rec boasts 12,000 acres, 120 parks, 70 miles of hiking trails, and 60 miles of paved trails! My very favorite park in Louisville, is Long Run Park on Flat Rock Rd. This property has been a family favorite for decades and when you visit, you’ll understand why. There is something for everyone and for every season. You can enjoy the basketball courts, biking trails, picnic shelters, and playground year round. In the warmer months, enjoy the golf course, fishing, boat ramps, tennis courts, and volleyball courts. There is even a new spray ground that the younger crowd will love! I have fond memories of taking a Sunday drive with a packed picnic dinner and spending hours here soaking in family quality time. Another favorite playgrounds is in Crescent Hill Park. 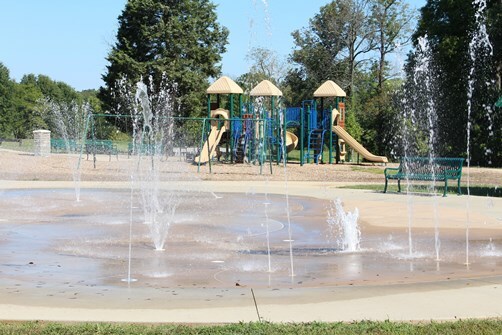 When the weather warms up, your family will enjoy the splash pad, swimming, and golf course. Cherokee Park is probably the most popular park in Louisville for it’s iconic scenery and history. It is located near the Highlands and Cherokee Triangle neighborhoods and is the most spacious with over 400 acres to enjoy! There is a scenic loop that takes you through the park, and you can walk, jog, or bike; just keep left to stay in the park, or keep right to exit. Your four-legged friends will enjoy the dog park at Cochran Hill Run. This park offers everything: ball fields, basketball courts, fishing, golf course, hiking trails, horse riding trails, reception sites, spray ground, and more! It is also one of the first parks designed by Frederick Law Olmstead. E.P. Tom Sawyer State Park is popular for its BMX bike track, dog park, indoor basketball courts, and public pool with splash pad. Teambuilding and recreation activities can be scheduled, and the picnic shelters can be reserved. Waterfront Park is a favorite attraction in Louisville with plenty to do and see. Unfortunately, flooding has impacted this park and crews are working diligently to clean it up and get things back in working order. The river level was 24 feet above average at the time I published this blog so please check their website for all updated information. Do you have a favorite park? Please comment below and let us know!